Aviators Open Las Vegas Ballpark with 7-Game Homestand! LAS VEGAS: The Las Vegas Aviators® professional baseball team of the Pacific Coast League (PCL), Triple-A affiliate of the Oakland Athletics, will face the Sacramento River Cats, Triple-A affiliate of the San Francisco Giants, in the 37th season "Home Opener" in the Silver State on Tuesday, April 9 at the grand opening of Las Vegas Ballpark® at 7:05 p.m. The first homestand of the 2019 campaign will consist of seven games against the River Cats from Tuesday-Thursday, April 9-11 (three-game series) and a four-game series against Fresno Grizzlies, Triple-A affiliate of the Washington Nationals, from Friday-Monday, April 12-15. All games will begin at 7:05 p.m. except for Sunday, April 14 at 12:05 p.m. The Aviators opened the 2019 campaign with a five-game road trip against El Paso Chihuahuas, Triple-A affiliate of the San Diego Padres, from Thursday-Monday, April 4-8. Las Vegas, under manager Fran Riordan, are in the first season as the Triple-A affiliate of the A's. El Paso has captured four straight Pacific Southern Division titles (2015-18) and will visit Las Vegas during the season homestand from April 24-28. The Aviators organization have the proud distinction of being the longest enduring franchise in the history of professional sports in the state of Nevada. Las Vegas is 17-20 (.459) all-time in season openers and 19-17 (.528) all-time home openers at Cashman Field (1982-2018). 2018 CASHMAN FIELD ATTENDANCE (final season): In 70 dates, Las Vegas total was 332,224 for an average of 4,746 in the final season for Triple-A professional baseball at Cashman Field. Las Vegas' largest crowd was a sellout of 12,512 vs. Sacramento on September 1. The Las Vegas franchise has reached the 300,000 plateau in "home" attendance in all 36 seasons (1983-2018) and the all-time attendance total now stands at 12,001,011. Game two of the series against the River Cats on Wednesday, April 10 will feature the first of 10 games broadcast live on YurView on Cox cable channels 14 and 1014 in high-definition. $2 Beer Night will be presented in the finale of the three-game series against Sacramento on Thursday, April 11. Proper identification is required for $2 beer night. Inaugural Logo Koozies will also be given out to the first 2,500 fans through the gates. Magnetic 2019 Aviators Schedules will be given out to fans from Wednesday-Saturday, April 10-13. The opener of the four-game series against Fresno on Friday, April 12 will feature an inaugural Aviators Logo Item to the first 2,5000 fans through the gates. Game two of the series against the Grizzlies on Saturday, April 13 will feature an Aviators Item to the first 2,500 fans through the gates. Sunday Family Day and Aviators Sunglass, to the first 2,500 fans through the gates, will be featured against the Grizzlies on April 14. The Aviators Team Photo, to the first 2,500 fans through the gates, will be featured in the homestand finale against the Grizzlies on Monday, April 15. Following the first homestand, the Aviators will embark on their second road trip of the season to Northern California beginning on Tuesday, April 16 against Sacramento. The three-game series against the River Cats will conclude on Thursday, April 18. Las Vegas will then travel to Fresno to face the Grizzlies in a four-game series from Friday-Monday, April 19-22. The first scheduled off day for the PCL is Tuesday, April 23. The Aviators will broadcast all games on Lotus Broadcasting on NBC Sports Radio AM 920 'THE GAME', which will carry live all 140 regular season games. 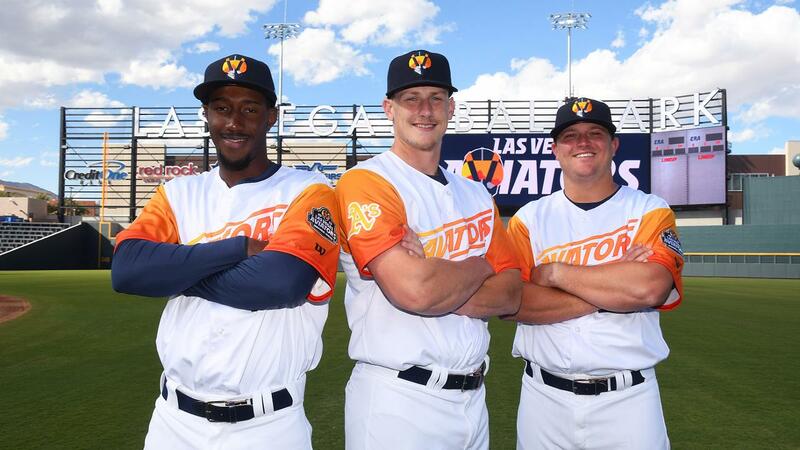 Also, all games will be available on the Aviators website (Major League Baseball Advanced Media, MLBAM) at www.aviatorslv.com. Russ Langer, the 10-time Nevada Sportscaster of the Year by the National Sportscasters and Sportswriters Association (NSSA), is in his 20th season behind the microphone calling Aviators baseball. All Aviators games (home & away) will also be broadcast on MiLB.TV via aviatorslv.com. Tickets for all Aviators home games can be purchased at the Las Vegas Ballpark Box Office (which will open on Tuesday, April 9). Monday-Friday from 10 a.m. to 6 p.m. NOTE: Las Vegas Ballpark will call is located off Pavilion Center Drive near the main entrance to the ballpark, Will call is open 1.5 hours before the game and closed at the end of the game. Tickets can also be purchased through Ticketmaster (1-800-745-3000, www.ticketmaster.com). The Aviators will be offering a military and first responders discount through the team's partnership with GovX (www.govx.com). The discount (TBD) will be available at the Las Vegas Ballpark box office. The individual game tickets for the 70-game home season are subject to dynamic pricing. 2019 season tickets are on sale at the Las Vegas Ballpark Sales Center located at 1870 Festival Plaza Drive, Suite 190 in Downtown Summerlin®, phone number is (702) 943-7200. Official licensed Aviators team merchandise is available on the "Team Shop" section of the website.